At the young age of six, Daniela emigrated from Mexico to the United States with her family. Although Daniela was discouraged by the language barrier and found herself struggling with school, the opportunity to show her younger siblings how to be successful motivated her to overcome these challenges and continue her striving for success. She wishes to empower her siblings to follow in her footsteps and pursue a college degree. During her years at High School of Telecommunication, Arts and Technology she took seven Advanced Placement courses and kept herself busy with a rigorous course schedule. As a result, Daniela recently graduated with an Advanced Regents Diploma and will be heading to St. John’s University, Queens Campus in the fall with a focus in Psychology. Since being a part of the CHCI program, Daniela has been a Posse Foundation Scholar semi-finalist, won 1st place at the Network for Teaching Entrepreneurship Global Girls challenge, and has been actively helping her community and school in encouraging and assisting students in the college application process. She has been an annual volunteer at CHCI Ready to Lead events and recently joined CHCI in co-presenting a the College Board Prepárate conference in New York. Daniela credits CHCI for giving her the confidence she needed to have a positive voice and influence in her community. Prior to R2L NextGen she felt that her voice was not being heard. CHCI was able to empower her, give her the tools needed, and be the influence to become an active and effective leader. 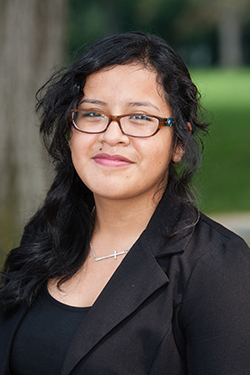 Because of the great impact that CHCI had on her life, Daniela hopes to work for or create a non-profit that gives undocumented youth a chance to become engaged citizens and make a differences in their communities. She truly believes that each person needs to be fearless, embrace what the future has in store for them, and know that a small change can make a big difference! The CHCI Familia is incredibly proud of Daniela for putting her knowledge and talents to good use in her own life, inspiring the lives of others, and in her own community. We wish her the best of luck and more success in the next phase of her life as she begins college, and we look forward to seeing her rise as a leader. To support dynamic students like Daniela Alvarado Vargas and CHCI’s programs such as R2L NextGen, please visit: www.chci.org/donate.